Spring is just around the corner. Time to spruce up your Keller home, clean out those dusty corners and say goodbye to winter. You're not alone in the spring cleaning adventure — according to the American Cleaning Institute, 91 percent of Americans participate in spring cleaning. As you join your fellow homeowners this year, don't forget to show a little extra love to those hardwood floors. 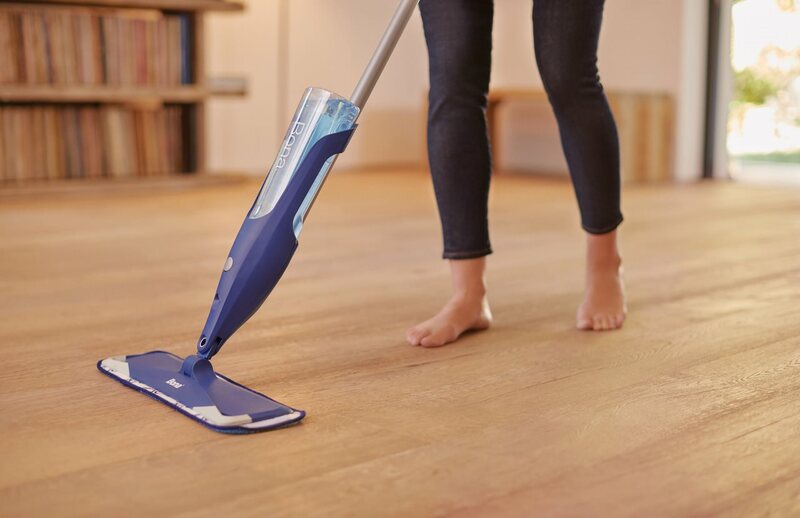 The floor is the largest surface in your house, so caring for and cleaning your floors is important to keeping the home healthy and dust-free. Particularly for hardwood floors, a little care goes a long way in keeping this central feature in your home looking beautiful. Here are a few easy spring cleaning tips to care for hardwood floors the right way — quickly, efficiently and safely. 1. Clear out the clutter. Spring is a great time to declutter, and clearing out the room not only looks cleaner but will allow fewer places for those dust bunnies to collect. Carefully move large items out of the way, so you can give the room a wall-to-wall, thorough clean. If you have limited space, move a couple of pieces of furniture at a time. Enlist help from family or friends to avoid scratching your floors and to prevent a back injury! This is also a great opportunity to consider a new furniture arrangement, or to clear out little-used or worn-out items to open up your space. 2. Banish the dust. 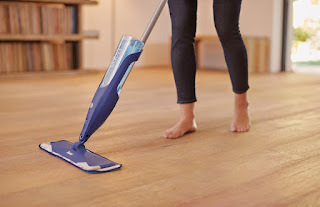 Dust, sweep or gently vacuum hardwood floors first to remove all of the loose dust, accumulated pet hair and fine debris. Even small particles of dirt can create micro scratches in the finish. 3. Get the right tools. Not just any old mop will do. Old-fashioned sponge or string mops tend to just push the dirt around, or they can leave streaks of dirty water on your hardwood floors. For more effective cleaning on any kind of flooring, newer models do the trick. That means covering more floor surface in less time. New mops also have rubberized corners to prevent damaging baseboards or furniture during your enthusiastic cleaning. Use a washable, reusable microfiber pad designed for hardwood floors to ensure dirt is lifted and trapped in the pad rather than just pushed around the room. 4. Use the right solution. Did you know that some floor cleaners can actually damage hardwood floor finish? Standard soap and water, and products containing ammonia or vinegar-and-water solutions can strip the finish and dull your hardwood floors — even when diluted with water — making them look and feel less clean. Oil-based cleaning products can leave a residue, making the surface of your floor dangerously slippery. Instead, look for a residue-free, non-toxic cleaner specially developed to help clean and protect hardwood floors and protect your pets. 5. Protect your floors. After cleaning your hardwood floors, consider using easily washable or vacuumable rugs under furniture to prevent marks or scratches from marring your hardwood floors. Furniture pads are another inexpensive investment to protect the floor finish. Finally, add doormats at key entryways in your home to grab dirt and debris before it ever hits the floor. The floor is the largest surface in your home, which gets the most wear and tear. A room with a clean floor looks and feels so much better. With the right tools and little effort, you can get your hardwood floors — and your Keller home — looking springtime ready.